About the only tranquil place in Caracas over the last few days is a hilltop military museum housing the remains of late socialist leader Hugo Chavez. Visitors tip-toe around his marble sarcophagus, reprimanded by guards if their voices rise above whispers. Outside, a shell-shocked nation is still reeling both from Chavez's death from cancer last month and a week of violence and recriminations over the disputed election to succeed him. Nightly protests - government supporters launch fireworks, opponents bang pots and bans - have been shaking the capital Caracas and most other major cities in the South American nation of 29 million people. 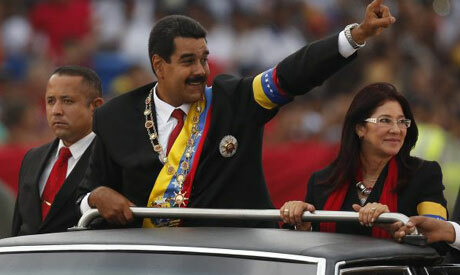 The beginning of Venezuela's transition into the post-Chavez era could hardly have been more raucous or controversial. The dispute over Chavez protégé Nicolas Maduro's narrow presidential vote win led to the deaths of at least eight people. It has also deepened the near 50-50 split in a nation polarized by Chavez's socialist policies, shown the fragility of Maduro's grip on the "Chavismo" movement, and left a raft of fast-accruing economic and social problems on the back burner. "If we're at war among ourselves, everyone suffers," said construction worker Elias Simancas, 61, sitting on a bench in a square where police clashed with masked and rock-throwing protesters during riots after last Sunday's vote. "We just want a country in peace," he said, expressing an oft-repeated sentiment by the less vocal but majority voices on both sides of the country's political conflict. As well as longing for some quiet and normality after 14 years in the global spotlight under Chavez, Venezuelans also want plenty more tangible things on their street corners. First on their wish list is an end to murders, kidnappings and violent robberies that rival the world's worst crime spots and leave many Venezuelan towns and cities eerily quiet at night. Beyond that, most Venezuelans of all political creeds want an end to runaway price rises, shortages of basic products, power cuts, potholes, cronyism in politics, and the insulting rhetoric between politically divided neighbors and families. "I'm sick of it. I want out. How can I bring up kids in this country?" said Manuel Pereira, a 39-year-old businessman who has seen his electronics importing company collapse due to lack of access to foreign currency under government controls. Debating Venezuela's future with middle-class friends on Saturday morning as their children held weekend soccer training - instead of a local league match, canceled due to the unrest - he said he was going to use his Spanish roots to try and emigrate this year. Just as during Chavez's two-year battle with cancer, his re-election last year, and his death on March 5, ideological disputes rather than grassroots issues fill the headlines and dominate government and opposition agendas. Opposition candidate Henrique Capriles' decision to contest Maduro's election victory - by less than 2 percent, or 265,000 of nearly 15 million votes - uncorked passions and resentments built up during Chavez's rule. The day after the election, Venezuela teetered on the edge of all-out crisis as pro-opposition hard-liners took to the streets in protests that turned violent and, according to the government, killed eight and injured many more. Capriles publicly distanced himself from the bloodshed - blaming government instigators for the violence and accusing officials of exaggerating and exploiting the trouble - and called off a march in Caracas that may have turned violent. The election board then agreed to audit the result, helping to take more heat out of the immediate situation. Longer-term, the political standoff remains unresolved. Though safely sworn-in, endorsed by his peers in South America and very unlikely to see his win overturned by the audit, Maduro cannot hide from some obvious conclusions after the vote. Clearly he failed to replicate Chavez's popularity despite presenting himself as his devoted "son" and deploying much of the state apparatus at his service for an emotion-charged election just five weeks after Chavez's death. Lacking the charisma and iron grip of his mentor, and with a weaker mandate at the polls, Maduro may now struggle to keep the ruling Socialist Party together given its competing interests and factions ranging from socialist ideologues to military chiefs and businessmen. There have already been a handful of calls from within the movement for a period of soul-searching and for improving social services to win back the more than half-a-million 'Chavistas' who defected to Capriles during the election campaign. "Let what needs correcting be corrected and what needs rectifying be rectified," said Foreign Minister Elias Jaua. Furthermore, though Maduro condemns his opponents as "fascists" and "ultra-right," almost half of Venezuelans voted against him and question his legitimacy given opposition leaders' claims of thousands of irregularities on polling day. Many Venezuelans are deeply frustrated that their OPEC nation is not doing better economically despite being rich in natural resources from abundant rivers for hydropower to the world's largest oil reserves. Opposition supporters are downhearted at having come so close to the prize but just missed out. The Democratic Unity coalition is also a disparate and fragile mix of right- and left-wing parties and competing egos. Capriles' surprisingly strong showing - most opinion polls before the vote had left him for dead - has cemented his standing as the undisputed opposition flag bearer and reduced the probability of what many had anticipated would be an opposition implosion after a comfortable Maduro win. But Capriles faces public vilification by Maduro, possible legal charges against him over the violence, and a potential move to debar him from the governorship of Miranda state, where he is serving a second four-year term. "They should get rid of him and find a proper democrat to run the opposition," said Andrea Lopez, a government supporter in Caracas' largest slum, Petare, saying Capriles should be put behind bars for the week's events. "Some of my 'Chavista' neighbors even voted for him. They were deceived by his lies. Now they have seen the wolf in sheep's clothes. If he had won, we would have lost everything," she added, listing the health, education and other welfare projects that sprung up in her neighborhood under Chavez. With Maduro in a tricky situation and the economy slowing, Capriles will likely look to consolidate an image as Venezuela's president-in-waiting. "This is unfolding chapter by chapter," Capriles said. "The whole system is collapsing. It is a castle built on sand." The awkward economic backdrop adds to Maduro's challenges, especially if the gloom-and-doom predictions of most Wall Street and private analysts are to be believed. They see economic growth slowing from 5.6 percent in 2012 to perhaps half of that or even lower this year, inflation heading for 30 percent, bottlenecks in dollar supply for businesses, and shortages of basics from flour and sugar to medicine and tampons. "Time is on the opposition's side as the economic and likely also political dynamics may contribute to weaken the government," said Goldman Sachs analyst Alberto Ramos. He predicts just 2.2 percent growth in 2013 and a minimum 25-percent currency devaluation in 2014 or earlier. Balancing that, economic naysayers have exaggerated Venezuela's economic woes in the past, and the billions keep pouring in from the nation's oil production. All the signs so far are that Maduro will stay faithful to Chavez's economic policies, including costly fiscal strategies to maintain and expand the social welfare "missions" that were the cornerstone of his late boss's popularity. In the immediate aftermath of Chavez's death, Maduro, a burly former bus driver who became foreign minister, was seen in many quarters as an affable and experienced diplomat who could be a potential reformer and bridge-builder. There was talk of possible free-market economic tweaking, rapprochement with the United States, dialogue with the opposition and amnesty for political prisoners. But his need to imitate Chavez's rhetoric during the campaign, then the post-election dispute, have seen him looking every bit the hard-liner in public. That may be exacerbated by his dependence on the support of tough-talking National Assembly head Diosdado Cabello, the country's second most powerful official, who had been seen as a candidate for the top job before Chavez gave his blessing to Maduro. Cabello showed his teeth last week, banning opposition legislators from speaking unless they recognized Maduro's win. "Capriles wants chaos," said Cabello, a former military comrade of Chavez who keeps strong ties with the security forces and is seen as the muscle in government behind Maduro. "But we're not idiots! There is no weakness. We swear to defend Chavez's legacy."